Genera Limited is New Zealand’s only licenced operator of the BioVapor Heat Treatment System. This world leading system is a MPI Biosecurity New Zealand approved alternative to Methyl Bromide in a number of sectors. Based at the Ports of Auckland we have equipment that can treat cars, containers, timber and dunnage. Containers and cars can have a turn around time of 1 hour. A short turn around time reduces the risks of demurrage charges on the port. Heat Treatment can be used as an alternative to Methyl Bromide fumigations for imported used vehicles, machinery, shipping containers, non-compliant timber, and ISPM-15 treatments. Full backing of Ports of Auckland. Proven technology with more than 5– years operational experience in BioSecurity applications. MPI approved treatment provider with MPI endorsed Standard Operational Procedures (SOP’s). Heat is pumped into the heat treatment facility whilst the cool air is also sucked out until the minimum required temperature is achieved. Six data loggers are placed at different points to record the temperature to ensure that the entire commodity has reached the required temperature. The whole treatment is monitored by our technician with accurate and precise real-time computers that can control temperatures to /- 1 deg C. If temperatures are getting too high the technician can quickly adjust this. The temperature is recorded on each data– logger every 10 seconds. The fully computerised temperature and time logging system is for full audit traceability and control. Trust Genera for all of your fumigation needs. Our vehicle heat treatment unit allows us to treat up to three medium sized cars at the same time. We can also treat different size vehicles such as boats and caravans. 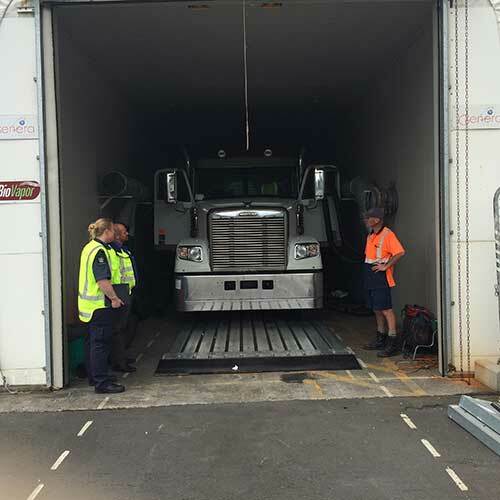 Fumigation for unusual or large sized vehicles may prove difficult sometimes, time consuming and expensive for the client where as heat treating a vehicle allows a turn around of one hour including MPI clearance. Heat treatment has been proven as successful fumigation alternative with 1,000’s of vehicles treated at Ports of Auckland over the last 5 years. The MTU is for heat treating containers. This MTU is a self-contained mobile heat-treatment system with up to 600kW output for effective thermal treatment. Two 20ft containers can be heat treated at the same time or one 40ft container. Simultaneous six-sided external and six-sided internal treatment of containers. The key benefits are: No need for venting containers post treatment so containers can be entered and used immediately. Dehumidifies and deodorises containers during treatment. Treats for all biological pests: insects (arthropods), fungus, viruses, pathogens and most common bacteria Real time MPI certificates and product release on completion of treatment decreasing risk of demurrage or Port charges. Ability to dry containers to a guaranteed humidity level within minutes for exports of moisture sensitive product. Heat Treatment operation works in tandem with our Fumigation operation. If we can’t heat treat we can fumigate thus offering a full range of services Comparable price to Methyl Bromide fumigation without the environmental or health and safety concerns and a quicker turn around of product.